Never seen a shooting star? Astro Live Experience has the solution. Share the post "Never seen a shooting star? Astro Live Experience has the solution." Have you ever seen a shooting star? It is a marvellous phenomenon that can be enjoyed on the suburbs, away from the city lights. They are believed to bring luck to anyone who sees one. 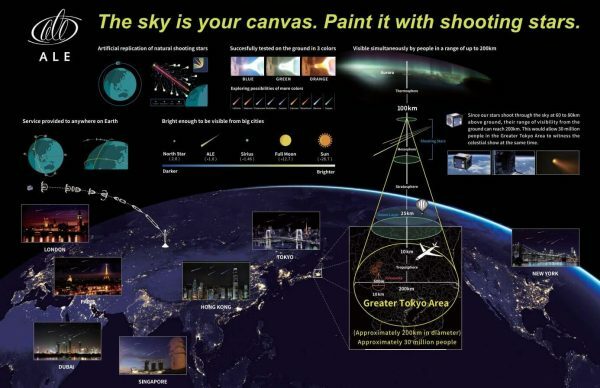 In this case, we can say that the participants of “Sky Canvas” in 2020 will be very lucky. Astro Live Experience wants to launch a satellite to help perform artificial meteor-shower. The experimental satellite will be launched today, on 19th of January 2019. It is loaded up with 400, 1-2cm spherules, made of metal and filled with chemical substance, which composition is kept a secret. They are supposed to catch fire when entering the atmosphere and leave long, luminous tail. A first meteor-shower will be performed on the suburbs of Hiroshima, Japan. Behind the idea of artificial meteor-shower, there is hidden a personal story. Lena Okajima, chief executive officer of ALE, as a young girl used to watch shooting stars in her village. She was truly fascinated in meteor-showers. When she moved to Tokyo, due the light pollution, she was unable to watch them. That’s what inspired her to dedicate 19 years of her research to create an artificial shooting stars. She has been working on her idea since 2009. 10 years later, her dream might become true. The price of one man-made meteor-shower is around 1 million dollars. Therefore, the client pays for some improvements compared to the traditional meteor shower. The meteors’ tails will have different colours: blue, green and orange. Their light will last as long as it lasts for a real meteors: just a few seconds. The company states, that the load placed in the satellite will be enough for 20/30 shows. Shooting stars produced by ALE can be seen from 120 mile distance. They are also made form non-toxic for environment products, which minimises the influence of the shower on the environment. Lena Okajima believes that artificial shooting stars can help scientists find out more about meteors. On the website of the company is stated: “By studying the path of artificial shooting stars where the angle of incidence, velocity and materials are known, we hope to be able to better understand the mechanics of naturally occurring shooting stars and meteorites”. Meteor-showers can be a wonderful experience, whether you are a child or an adult. Astro Live Experience hopes, that their shooting stars can be a cheaper replacement for the firework or laser shows during many events. They are especially hoping to provide the pyrotechnics at the Summer Olympic Games, held in Japan in 2020. For now, we can only wait until the first “Sky Canvas” to see, what happens. Even though the artificial shooting stars might not seem to be a life-changing invention, it can be a complementary part of many events in the future. Maybe it will turn out as a great source of entertainment, gathering people under the night sky, just as Lena Okajima wishes. This is a very interesting idea. Artificial shooting stars seem to be great entertainment, especially in places where it’s hard to find conditions which would be favourable for meteor-shower watching. Big cities would for sure benefit from this kind of solution instead of fireworks on celebrations like New Year’s Eve or Independence Day. If it won’t make any harm to the environment, it can be one of the best sources of entertainment. I really believe in that too. This method can make people happy. As simple as that, yet it is very powerful force. This case occurred to me as very inspiring, working over some kind of a dream to transform it into a reality. It makes the ideas feel more powerful than we think they could be. This project looks very beautiful but there is one concern I have. Do we need another satelite in our atmosphere? We don’t have good enough ways to get it back. It just doesn’t serve any purpouse, it only looks good.